In 1944 a provocative exhibition opened at the Museum of Modern Art curated by Austrian-born architect Bernard Rudofsky which asked the question “Are Clothes Modern?” In his accompanying book for the exhibition, Rudofsky minced no words in his opinion of fashion. In his view fashion “is based on envy and the urge of imitating the envied. It presupposes the existence of an aristocratic minority—aristocratic in the sartorial sense—that sets the ‘style’ and the pace of style rotation.” He felt fashion is undemocratic and “fits the totalitarian state perfectly,” harsh words for a country emerging from a war against two totalitarian states to hear. He was particularly critical of the changing fashionable silhouette. The exhibit featured sculptures of distorted figures—a woman with a “bustle body” who looked like a centaur, another with a huge mono-bosom. He had particularly harsh words for women’s hats, pointing to their artificiality. “Alas, we do not think any more of adorning our heads with a wreath of flowers. Women’s heads are frequently garnished with the artificial kind. They are traditionally arranged on a platter which by common consent is spoken of as a woman’s hat.”  Rudofsky felt that all fashion was completely frivolous and had no place in the modern society he foresaw developing in post-war America. Rudofsky’s predictions for the world of fashion did not come true, Indeed, he ended up working in the fashion world himself. He established Bernardo’s, a company that made elegant simple sandals what were the embodiment of his view that clothing should be simple and body-affirming. No stilettos for him. Seventy years went by. Exhibits of fashion became more and more numerous and drew large crowds. 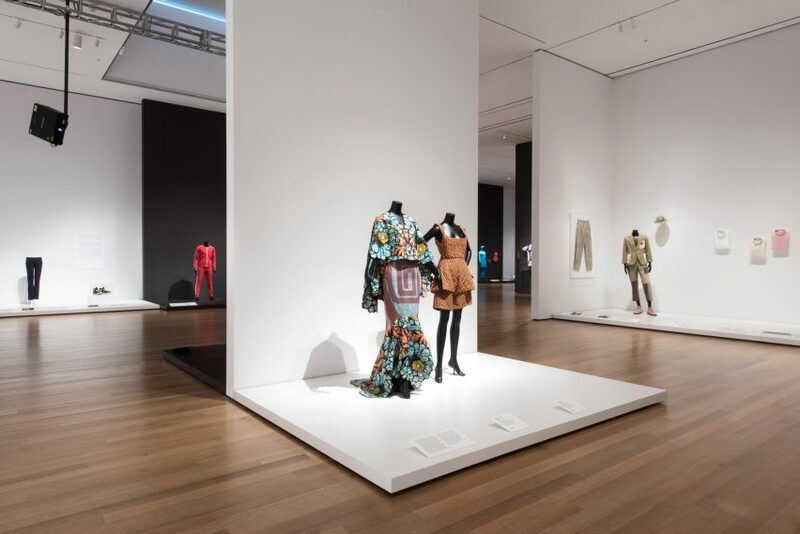 These exhibits and increasing scholarship in the field established the fact that fashion was not simply about women’s clothes, but a design field that influenced men and women of all ethnicities. So, MOMA now has its own exhibit of 111 items that the curators have decided transcend fashion since they are deemed iconic, like the white t-shirt, that continue to be worn year after year. Items: Is Fashion Modern? explores the present, past—and sometimes the future—of 111 items of clothing and accessories that have had a strong impact on the world in the 20th and 21st centuries—and continue to hold currency today. …. Driven first and foremost by objects, not designers, the exhibition considers the many relationships between fashion and functionality, culture, aesthetics, politics, labor, identity, economy, and technology. That’s a tall order. The wall text at the entrance explains this exploration will be done by linking each item with three-part explanation composed of “archetype,” “stereotype.” and “prototype.” These leaves one wondering what those words mean. In an accompanying video Curator Paola Antonelli explained: “The stereotype is . . . close your eyes, and if you think of that item, what do you see?” That didn’t clear it up for me, but I was able to figure out that “archetype” meant the history of the garment which was covered in voluminous wall text. 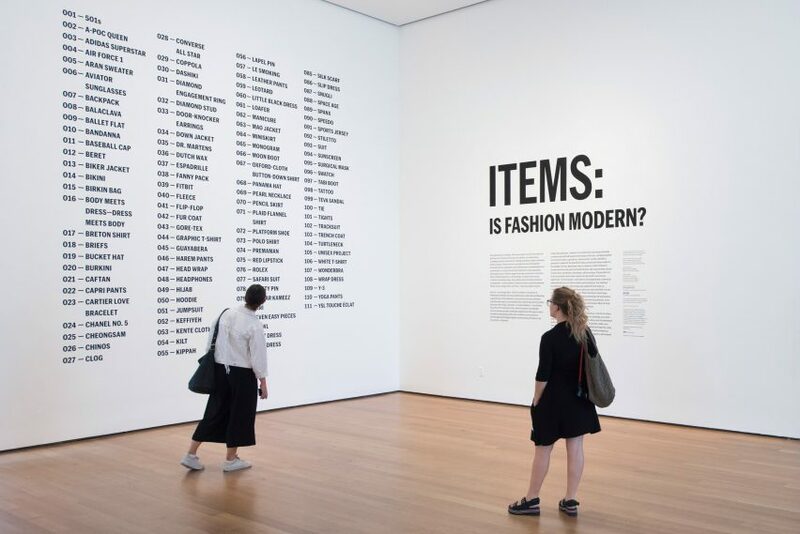 Many of the garments on display can probably be purchased at a big-box store, which is a good thing since MOMA has exactly four dresses, one coat, one shirt, and 4 head coverings in its collection. You find yourself wondering why this was necessary. Often the pieces were confusing. Artist Lucy Jones created a version of Spanx for a wheelchair-bound woman. 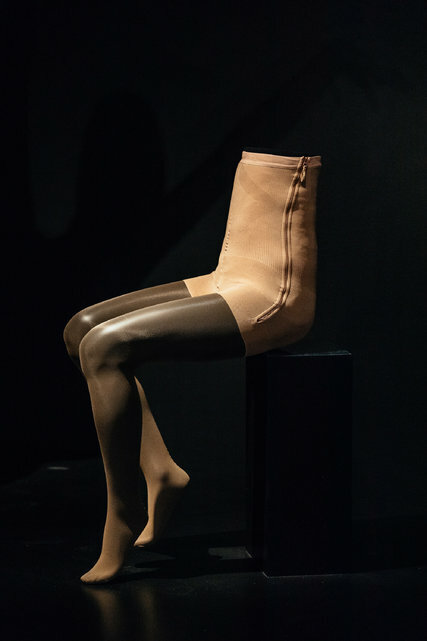 The seated figure was on a stool, not a wheelchair, so it took a while for me to figure out the meaning of what the side zippers on the Spanx were for. If I had any “conversation” after viewing this, it was to ask why the figure couldn’t have been mounted in a wheelchair, or, at the very least, with some suggestion of wheels. Another piece veered in the direction of science fiction. Mounted at the end of a long platform on the little black dress, it was the recumbent figure of a woman in an embroidered black body bag. Artist Pia Interlandi, who specializes in designing garments for the deceased, dyed the shroud with thermochomatic ink. As one watched, it slowly lit up showing blue hands of mourners on the last garment. I found myself wondering how these pieces connected to the “stereotype.” The whole process was tiring. The exhibit is mounted in the enormous gallery on the sixth floor, which has the effect of diminishing the “items” on display [see opening photo]. There are few pictures to show how these garments are worn, so the gallery looks like it is full of items that a large group of people simply left there. It diminishes the meaning of each item too. 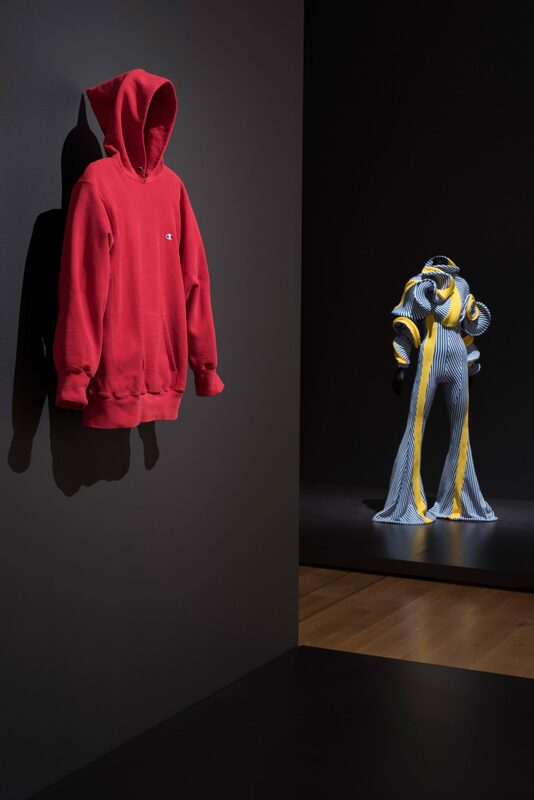 A red hoodie, which is supposed to evoke Trayvon Martin and his tragic death, simply looks like it was randomly hung there by the installation staff. To be successful, an exhibit has to blend the text, the objects, and images. It is difficult to connect the research and theory displayed on the walls with the objects themselves. There are voluminous labels with each piece, but they are often close to the floor and printed in very tiny type. At the end of the exhibit is a huge wall chart that aims to show the interconnectedness of the pieces on display. One would need binoculars to read it since the text is small and high on the wall. I was happy to see Rudofsky’s sculptures on display. It was like seeing some old friends, but it was hard to figure out how they fit into this exhibit. Since Rudofsky was so interested in the concept of the fashionable body, he probably would have liked a smaller exhibit that just opened at The Museum @ FIT. The Body: Fashion and Physique examines how the fashionable “ideal” body has changed over time, using garments from the eighteenth century to the present day. The show is focused and thought-provoking. The curators should have kept Rudofsky’s original title since this exhibit is not about “fashion,” which is a phenomenon of change spurred by the zeitgeist of the time. It about “clothes,” what we wear—a different subject. After I trudged through Items: Is Fashion Modern? I found myself wondering how long it will be before MOMA examines fashion again. Seventy years? Bernard Rudofsky, Are Clothes Modern? : an Essay on Contemporary Attire (Chicago: Paul Theobald, 1947), 232. Bernard Rudofsky, speech to meeting of the Fashion Group International, New York, NY, December 20, 1944. Vogue, February 1, 1945, 121. Nadine Stewart is currently an adjunct professor of Fashion Studies at Montclair State University. She has a Master’s degree in Fashion and Textile Studies from the Fashion Institute of Technology (FIT) and a BA in English Literature from Dickinson College. She has a longtime interest in millinery and milliners and is currently working on a social history of American milliners. She lives in New York City, right behind FIT!